This week’s bird mystery is the opposite of the one presented here last week. Last week, we had a bird that was seen and not heard; this week, we have a bird that was heard but not seen. The sound was a kind of cooing, or perhaps hooting, that I heard while I was sitting at my desk last month. At first, I thought it was the mourning dove on the battery-driven bird clock that my Secret Santa gave me at a Herald holiday party a decade ago. Yes, the clock is still working. I even went downstairs to check if the hour was right. But then I heard the cooing sound again, not on the hour and not at nearly the same time as I had heard it the first time. I considered the possibility that the sound could be coming from a mourning dove. Mourning doves have been known to winter here, but they are not hardy birds, mostly because their feet freeze. This leaves them unable to forage, and they starve to death. This has been a tough winter. So probably not a mourning dove. Besides, the sound wasn’t quite right. The cadence was different. It had a slightly hollow sound, unlike the rich, full cooing notes of the mourning dove. So, then I wondered if it could be an owl. This is the season for owls. They’re establishing territories and establishing themselves ahead of the breeding and nesting season. There’s been a great-horned owl hanging around my place. Great-horned owls are mostly nocturnal, but it wouldn’t be impossible for an owl to be calling, especially on an overcast, gray February day. Another possibility I considered was the rock dove or common pigeon. I rejected that out of hand, again because the sound was wrong and because pigeons are show-offs, seldom bothering to hide themselves. Plus, they usually occur in crowds. There’s one other possibility, and that must have occurred to some of you. But I rejected the Eurasian collared dove because I hadn’t seen the bird, and if a collared dove were around, I would expect it to be feasting at my feeders, but I never caught it there. Collared doves were a possibility, I knew. They’ve colonized many of the small towns in northeastern North Dakota, where they often scavenge spilled grain near elevators. I’ve had many reports from people entertaining collared doves at feeders in small towns, and some from larger communities such as Devils Lake and Grand Forks. But I’d never heard any from the countryside. So I was predisposed to doubt the bird could be a collared dove. But that is what it turned out to be. I know this because I encountered two of the birds when I walked up to the mailbox late one morning. Actually, it wasn’t so much of an encounter as it was a “fly by.” The birds were heading west at velocity, moving from one sheltering evergreen to another on the other side of the yard. There was no doubt they were collared doves. They were doves, clearly, by the elongated shape of the body and the pointed wings. They were not mourning doves because they were too large. Plus, they showed off the telltale sign of collared doves, the collar itself. This is a narrow black band at the back of the neck that is usually pretty easily seen. The collar separates the collared dove instantly from the other doves that occur here. The rock dove is a plumper bird with shorter wings. It occurs in a broad color range. The mourning dove is similar to the collared dove in shape and general habits, but it is a more richly colored bird, brown overall but with subtle shades of tawny and rust. 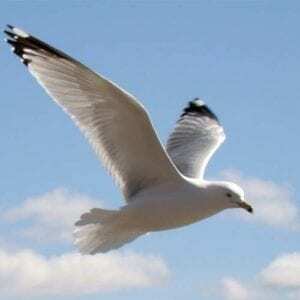 Plus, it has a decidedly pointed tail, giving it a kind of arrow-shape pattern in flight. The Eurasian collared dove is a plainer bird overall, usually appearing dull gray or off white, but sometimes showing some shades of brown or even pink. It has a square tail. Importantly, too, it has outsized bright legs and feet, bright red in color—tough looking feet. These may be the assets that allow collared doves to survive winters in the Red River Valley. The collared dove is a relatively recent immigrant, arriving in the United States about 1975 and in North Dakota in 1999. It’s become pretty well established—and for me from now on an expected, not a surprising, species. A PERSISTENT pigeon feeder has vowed to continue his hobby despite being fined £300 by a court and warned he faces jail if he continues. Paul Charlton is known as the ‘Pigeon Man’ in Bath, Somerset, where he draws large crowds by allowing dozens of birds to balance on his arms and head. Last year he was slapped with a Community Protection Notice by the council but was convicted of breaching it on a number of occasions. He has now been handed a two-year Criminal Behaviour Order and warned he will be hauled back before magistrates and jailed if he breaches it. But Charlton, 42, claims that feeding the birds is his ‘profession’ and he is refusing to pay the fine or stop encouraging the airborne menaces. Charlton was spotted breaching his order on three occasions – May 9, May 10 and September 23 last year. He denied three counts of breaching the notice against him but was convicted in his absence on November 21. The eccentric performer earns a living by balancing pigeons on his arms, shoulders and head and gives members of the public grain to feed them in exchange for coins. Speaking before the sentencing, he said: “This has been my job for the past four years. It is how I pay my rent and my bills. I make a living out of it. Barrister Carrie-Ann Evans, acting for Bath and North East Somerset Council, told the court: “He understood what was required of him to stop feeding the pigeons. She also read out a victim statement from the manager a café by the Roman Baths, who said: “Paul Charlton feeds the pigeons directly outside my premises. “We have a responsibility to make sure the tables are clean and hygienic. Kendrapara : About a hundred pigeons have succumbed to an unknown disease triggering avian flu scare in a far off village in Mahakalapada tehsil of Kendrapara district, sources said. Some death incidents of fowls were also reported from nearby localities last week. The avian beauties are dying almost on a daily basis, a veterinary official said. With scares of bird flu gripping the state after such incidents of crow deaths and culling of poultry at Khurda, Keonjhar, Rourkela the deaths of pigeons in Mahakalpada has triggered panic situation of bird flu. Meanwhile, veterinary experts have visited the area to take stock of the situation and have collected blood samples of the winged species for laboratory examination. Although the exact reason for the death of the birds is yet to be confirmed experts said there was no reason for panic since the deaths could also be due to ‘Ranikhet’, a virus borne disease or could be due to Vitamin C deficiency or even due to food poisoning, a senior veterinary official said. HYDERABAD: The blue rock pigeon, one of the commonest birds in urban areas, has been given notice. At least at the main entrance of the KBR National Park in Banjara Hills. Every morning and in the evening, a man armed with a stick stands guard there and drives the birds away from the driveway outside the park gates. But with no studies ever conducted in Hyderabad on the health impact of large congregations of blue rock pigeons on humans who come in close contact with them, Naveen says the case so far is of “noth ing reported, nobody both ered”. This photograph illustrates one important reason for maintaining and hopefully extending the population of our native wood pigeon or kereru. About to be swallowed is a red plum about the size of a $2 coin. Most observers, when comparing the size of the plum with a pigeon’s quite narrow red bill can’t really imagine how the bird’s bill could open wide enough to allow the plum to be swallowed. However, a few seconds after the photograph was taken the plum was gone. The bill is hinged in such a way that quite large fruit can be swallowed whole with ease. Five more plums were eaten before this bird flew away to a nearby gum tree for a rest. Now a number of our native trees such as miro, karaka and tawa have large fruit and the native pigeon is the main disperser of the seed of these trees. Without the pigeon, conservationists predict that there would be minimal regeneration of these important native forest trees. The trouble is that kereru is under threat. Predators such as stoats, cats and opossums take both eggs and young pigeons and unfortunately they are still being poached by short-sighted humans who believe that a feed of pigeon is more important than the efforts to conserve this valued species. Fast moving cars also injure and kill a number of low flying pigeons and it’s good to see “watch out for kereru” road signs appearing in many districts. Four pigeons visited this particular plum tree and during about a week the red plums were gone, and so were the pigeons. Just down the road was a yellow plum tree with slightly larger plums and the change of colour didn’t seem to bother the pigeons. Superb Story can add the totepool Hogmaneigh Handicap Hurdle (2.50) to his big Cheltenham Festival win at Musselburgh. Young Skelton pulled off a fine training performance to bring him back from a lengthy lay-off to prevail in the ultra competitive County Hurdle at the big meeting, but suffered the reverse side of the coin when the gelding had to be pulled up in the Galway Hurdle in the summer. Given plenty to of time again to recover from those exertions, Superb Story is back in great heart and connections have long targeted this valuable objective. He still looks well handicapped despite a big weight and he’s the type to continue to improve in readiness for a return trip to Prestbury Park in March. Vyta Du Roc was not beaten that far in the Hennessy on his return to fences five weeks ago and he looks to have found a good opportunity in the Watch Live Racing On BetBright.com Handicap Chase (12.50) at Cheltenham. Henderson opted to give the Welsh National and a return bout with Hennessy hero Native River a miss with the eight-year-old in favour of this less demanding test and the move should pay dividends. A smart novice last season, he is back in A1 nick at home. Whisper is a difficult horse to read at times, but he seems on great terms with himself at the moment and should maintain his unbeaten record this season in the BetBright Dipper Novices Chase (1.25). Henderson has had plenty of problems with this high-class staying hurdler over the past 12 months, and he was only hopeful he might prevail on his chasing bow at Exeter on this day 12 months ago. However, Whisper never fired at all. Once again, expectations were not that high on his return here last month, but that was only down to a lack of peak fitness. Under a fine ride from Davy Russell, he jumped nicely and overcame the pre-race fears by galloping on strongly up the hill to notch his first win over larger obstacles. He took some useful scalps along the way and the Seven Barrows shrewdies are now looking for him to step up another level, especially after an accomplished schooling session under Noel Fehily on Mandown in Upper Lambourn on Friday morning. Stablemate O O Seven will also go well but the Nicholls-trained Clan des Obeaux should be the toughest nut to crack. Lough Derg Leader can emulate former stablemate Singlefarmpayment and win the Betbright Casino Handicap Hurdle (2.35) for Tom Lacey. The six-year-old has made great strides north in the ratings so far this season and should be more than able to overcome a lumpy 11lb hike in his assessment for an impressive win at Doncaster last month. The concluding EBF Stallions & Cheltenham Pony Club NH Flat Race looks a fascinating renewal, with some of the top trainers around represented, but perhaps Newmarket mayor John Berry will be able to strike a blow with White Valiant. The son of Youmzain overcame odds of 80/1 to win on his racecourse bow at Huntingdon, scoring in great style under Daryl Jacob. Jacob is required to ride Daphne Du Clos for Henderson and Potensis Bloodstock on Sunday but Davy Russell is an eyecatching booking for Berry, who looks to have a very useful tool to go to war with. The very much in-form Fehily forsakes Cheltenham for the delights of Haldon Hill and Exeter, and he should kick the afternoon off on the right note with the highly-rated and impressive bumper winner Neon Hill in the opening Passage House Inn Topsham ‘National Hunt’ Novices’ Hurdle (12.40). It was one of those trees that one sees and still does not see, hiding in plain sight. I had walked near it many times and often glanced at it when scanning the landscape, but never actually looked at it. Perhaps its size was the reason. It was small for a banyan, barely two stories tall, standing behind a shack at the corner of a village crossroad near a cluster of tea shops. On one side were small patches for growing vegetables, followed by a bamboo grove. On the other side, a rapid descent into a rectangular plot where the earth had been dug out neatly. Underneath the banyan grew smaller trees, weeds and tall grass. Tucked away at a neglected corner of the road to nowhere in particular, the banyan never gave me reason for a second look. I would have continued ignoring it were it not for a village boy. One day, when I was searching for birds in the village, he appeared at my side. “What are you doing?” he asked. “Looking for birds,” I replied. “That one?” I pointed. He nodded. I looked at the tree carefully now, top to bottom, side to side. Nothing was moving in the thick round crown of deep green. “But it is empty,” I said. After that conversation I was more attentive to the banyan. One afternoon, I was in the neighbourhood, looking for a coucal – a dark-red bird that looks like a cross between a chicken and a crow – that had ran into a roadside bush. Unexpectedly, I heard the loud flutter of wings and looked up to see a flock of green pigeons descending on the banyan. I was thrilled. I had been trying to photograph these yellow-footed green pigeons (horials) for a long time. Here they were, playing in the tree, swaying and jumping from branch to branch, gobbling up the banyan fruit. Their meal lasted for a few minutes and they took off, all together, in search of the next fruity tree. Spending more time at the banyan since that day, I discovered that its fruits attract coppersmith barbets, doves, bulbuls and many other birds in addition to the horials. One afternoon, while waiting for the horials, I saw something move in the bushes underneath the tree. It was a brown shrike, here for the winter from colder places, hunting for insects. And while I was watching it, a cuckooshrike landed on a plant right in front of me. It hopped around looking for its own insects. Then a drongo appeared – it was probably hunting in the fields – and buzzed the cuckooshrike repeatedly, trying to drive it away. But the cuckooshrike persisted, jumping from branch to leaf to grass, and kept hunting. And so life played out its ever mysterious moves in and around the banyan. If there is a banyan near you, this winter might be a good time for a closer look. Bath’s Pigeon Man has told magistrates they can send him to PRISON but it won’t stop him from feeding the birds. Paul Charlton got his nickname thanks to his act, in which he balances pigeons on his arms, shoulders and head and giving members of the public grain to feed them in exchange for loose coins. But the 42-year-old is fighting an attempt by Bath and North East Somerset Council to stop him performing which could see him fined up to £2,500. Charlton appeared at Bath Magistrates’ Court on December 19 having been convicted of three charges of failing to comply with a community protection notice ordering him to stop feeding pigeons. Dressed in a dark suit with shirt, tie and waistcoat, he told magistrates: “You can put me in prison for as long as you like but when I come out I will go back and feed the pigeons. “I’m being treated like a criminal here and I haven’t done anything wrong. Last year, Charlton was issued with a community protection notice by B&NES Council ordering him to stop feeding the pigeons. But on May 9, May 10 and September 23 he was seen by council officers to be carrying on his act. Charlton denied three counts of breaching the notice against him but was convicted in his absence on November 21. At court for Charlton’s sentencing on December 19, a barrister acting on behalf of B&NES Council argued the defendant’s act caused “quite a lot of inconvenience” to cafés in the centre of Bath. Carrie-Ann Evans told the court: “Essentially the notice asked him [Charlton] to stop giving grain to members of the public to feed the pigeons and stop giving grain to the birds himself. “This is causing quite a lot of inconvenience for neighbouring cafés who have birds flying onto their stock. “As a result quite a large amount of stock has to be thrown away. “Mr Charlton was observed doing exactly what he was told not to do by the terms of the community protection notice. In response, Charlton claimed a “senior psychiatrist” had told him to continue feeding the birds. Charlton, of no fixed abode, faces a £2,500 fine for the three offences. B&NES Council has also asked for £450 costs. The case was adjourned until January 23 pending the preparation of a psychiatric report. Charlton was granted unconditional bail until then. Boone and Ames police are investigating about 14 reports of vehicles being damaged by clay pigeons overnight Sunday. Mathew Boley said he is still unhappy about what he woke up to Sunday morning outside his home in Ames. “I came outside and there were clay pigeons all over the ground next to my car, a few scratches and nice circle size welts on the side of it,” Boley said. Police said they hope the public will provide helpful information for the ongoing investigating. “We really would ask the public to come forward if they have any information, if they saw suspicious activity near Aplin Road or Story Street sometime Saturday night,” said Commander Jason Tuttle, of the Ames Police Department. Residents in Boone said they experienced the same type of vandalism. John Wilson said he saw the same as he was getting into his car to attend Sunday morning church service. He said he is frustrated and cannot understand why anyone could commit what appears to be a random act. “People gotta have better things to do than mess around, tearing up people and destroying property,” Wilson said. Police advise residents to park their vehicle in a garage or driveway if possible to protect their cars. Otherwise, police said it is best to park under a street light. ISLAMABAD, Pakistan — If any further proof were needed that geopolitical intrigue can stalk the humblest of Pakistan’s inhabitants, consider the recent cases of two Pakistani birds. The first is a pigeon, a species that people all over the country raise on their rooftops as a simple, inexpensive pleasure and a brief escape from their daily struggles with poverty, corruption and clogged streets below. Some weeks ago, tensions were running especially high between Pakistan and its perennial next-door rival India. The source was Kashmir, the disputed border region where Muslim protesters had been blinded with pellet guns and Indian soldiers had been burned to death in a late-night attack by insurgents. Into the fog of belligerent rhetoric between the two nuclear powers wandered a white pigeon, which was caught and caged by Indian security forces in a border district adjoining Kashmir. I realize I am sticking my neck out but would the Indian authorities please set the poor captive pigeon free? According to Indian news agencies, the bird was suspected of having “Pakistani links” and was carrying a warning message for Indian Prime Minister Narendra Modi. The arresting officer posed with his feathered prisoner, and the image soon circulated on social media. Around the same time, Indian authorities in Kashmir said that they had also discovered 150 dehydrated pigeons stuffed into a car and that they suspected the birds had been smuggled for purposes of espionage. 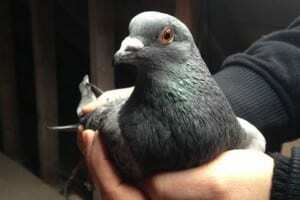 An official was quoted as saying the pigeons had suspicious multicoloured rings attached to their feet. All were turned over to an animal welfare agency while police investigated the case. No such outcry has yet been raised about the potential plight of another Pakistani bird, the houbara bustard, a grey-speckled, pheasantlike creature mostly found in North Africa. In Pakistan, this rare variety of bustard is considered an endangered species, and hunting it is banned in some regions. KARIM SAHIB/AFP/Getty ImagesA falcon, right, tries to catch a houbara bustard during a falconry competition in Hameem in 2014. This past week, the bustard too ran afoul of international politics, this time at the hands of Pakistan’s friends. Parties of Middle Eastern royals often bring trained falcons to hunt smaller birds in Pakistan’s northern mountains and southern deserts. For years, among their favourite targets have been bustards. One of the Sharif government’s closest allies is Qatar, and last month, a Qatari prince came to the prime minister’s rescue in a corruption case before the Supreme Court, where political opponents have accused him of hiding assets abroad, including a group of luxury apartments in London. Sharif, who has vowed to resign if found guilty, said he had broken no laws but was struggling to explain how his family had acquired the apartments without a money trail or tax bill. Suddenly, the Qatari prince provided a letter stating that his family had given them to the Sharifs as part of an old business settlement. This week, a Qatari prince from the same family was issued a special permit to hunt 100 bustards in northwestern Khyber-Paktunkhwa province. According to Dawn, the province’s wildlife conservator objected, saying it was a protected species. The matter has not been resolved, but the paper reported that another Qatari royal had recently “faced some resistance” while attempting to hunt bustards in Balochistan province. In my apartment, there is a picture window that looks out on the Glennland Building, a half-block to the east. There, in late spring, two pigeons built a nest in one of the air-conditioning vents. It has been a pleasure to look out at their progress in this and, finally, at their expeditions to find food for their babies. Meanwhile, the president, commenting recently on police killings, mentioned the anxiety and tension caused by the 24-hour news cycle. In fact, some of the reporters claim their work is now reaching the immediacy of real time. But truly this is not so. All of these machines, starting with the book, give only abstraction and an aid to memory. For me, at least, the “real time” very quietly is watching the pigeons down the block. In that quiet you can then look up, see the sky, find the ground beneath your feet and so have the confidence to act if action is required. Now the book-internet development offers a kind of very important liberty. It may be a harbinger of the united world as a fulfillment of that liberty. But you must be weaned of it to use it or it might swallow you alive. So I say real time is not in these fascinating marks on paper or in sounds from cellphones, but in quietly looking out the window and enjoying the pigeons. They tell me this is true, and asked me to tell you as well. CHICAGO (FOX 32 NEWS) – Residents of the city’s North Side Uptown neighborhood said it’s not that they have anything against birds, but when it’s this many birds… Yeah, it’s a problem. “It’s nice that she feeding pigeons, but she’s creating a home for them and there’s hundreds of them,” Uptown resident Peter Wood, said. There is 2012 cellphone video of Young Kang, better known as the “pigeon lady” of Uptown. For years she has run afoul of city laws banning the feeding of pigeons and last week she was ordered to pay the price. A city administrative hearing judge found Kang guilty of 10 ordinance violations and ordered her to pay $300 apiece. All in all, a total fine of $3,000. It came after frustrated property owners installed a surveillance camera aimed at one of her favorite spots and documented Kang feeding the birds on multiple occasions. What doesn’t disappear, residents say, is the pigeon poop left behind on cars, sidewalks and buildings. “My car is parked right by there where she drops it every time, so I got bird droppings all over my car, you know?” Wood said. Other residents said they’ve seen an influx of rats and raccoons because of the food left on the ground. This isn’t the first time Kang has been in trouble. In 2012, Ald. James Cappleman (46th) told police Kang assaulted him when he tried to clean up her bread crumbs, prompting the City Council to raise the fines for illegally feeding birds. We couldn’t find Kang to get her side of the story but residents are hoping this latest big fine will finally force the pigeon lady to fly the coop. “I don’t want any harm to come to the woman who’s doing it. I know she’s doing it out of the goodness of herself but it needs to stop,” Anne Marie, an Uptown resident, said. MIAMI, Dec. 14 (UPI) — A thief broke into a Florida business to steal several high-priced pigeons while wearing a bucket to hide his identity. Surveillance showed the strangely disguised burglar, dressed in a trash bag, pilfering the expensive birds from El Viejo Lazaro Botanica in Miami despite security cameras and barbed wire, according to WSVN. The brazen robbery was the second time within a year burglars had target the store owned by Hernandez and his wife Mae. Hernandez said the most recent robbery saw the bucket clad thief make off with 40 racing pigeons valued between $100 and $1,000. “If this keeps happening I will be out of business,” he told the Miami Herald. The clumsy thief was seen tumbling over a fence surrounding the store and potentially causing harm to his stolen cargo. A couple of weeks ago I answered a letter from Greg Thornbury, who thought he was seeing a peregrine falcon flying around high-rise building where he works in Concord. I checked with Glenn Stewart at the Santa Cruz Predatory Bird Research Group, who said he wasn’t aware of any peregrines in that area, but that it was very possible. Stewart says peregrines can thrive in developed areas because of the plentiful supply of pigeons. The tall buildings also mimic the cliffs that peregrines prefer for nesting sites. There are pergrines on Mount Diablo that often are seen in Lime Ridge Open Space that stretches from the base of the mountain in Walnut Creek into Concord. Thornbury was able to get a photo of the bird and Stewart identified it as an adult peregrine falcon. The Concord peregrine may nest on Mount Diablo, but come into the city to feed during the winter. DEAR JOAN: I thoroughly enjoyed reading the letters about the foods some animals crave. As the wife of a veterinarian and a veterinary hospital owner for over 30 years, I have answered many emergency calls concerning ingested items. With the holiday season coming, I would like to add some non-food items that we personally come across this time of year. Never leave rubberbands, plastic foam peanuts, ribbon (especially the curling type), pieces of plastic or tinsel lying around. Once we treated a dog, a Lab, that had eaten a string of Christmas tree lights. All of these and much more can cause serious harm to pets, and frequently the lodged item will require emergency surgery, not a very merry event this time of year. In addition, on the days after Thanksgiving and Christmas, we see turkey, ham and garbage overdoses. Please hide your leftovers! May I add a few words in defense of veterinarians and their “exorbitant” bills? Nothing frustrates a veterinarian more than the Sunday afternoon emergency call when the owner says the animal has been sick since Friday and it may have eaten something bad. All a vet can offer at this point, without support staff, is a recommendation to the best emergency clinic in the area. It takes several employees to help x-ray and assist an emergency surgery. Veterinary emergency clinic services are life-saving, but expensive. A veterinarian completes the same amount of schooling as an M.D., but unlike R.D.s (real doctors, as we jokingly call them), a veterinarian also must have the skills of a surgeon, a radiologist, a pharmacist and a pediatrician, just to name a few. They must be able to diagnose and treat many different species, and that explains why a veterinary hospital, unlike a doctors’ office, is a full-service hospital, complete with a surgical suite, in-house lab, x-ray, pharmacy, and specialty pet food store. No one wants to drive their unhappy pets around to specialists, and my personal co-pay on my health insurance is just about the same as our office call. People living near a railway bridge in Frome say they have been plagued by pigeon faeces since an £8,000 pest control project forced the flock to move. Felicity Young, who lives near the Rodden Road railway bridge, said around a dozen birds have taken up residence on the roof of her house and are bombarding her property from above. She said the smell of faeces is overwhelming and is worried the birds may be damaging her home. Pigeon-proofing spikes were installed on the bridge at a cost of £8,000 in November. Frome Town Council and Network Rail teamed up to solve the problem of bird droppings under the bridge and chipped in half the money each. Since spikes were installed there has been a reduction in the number of pigeons on the bridge, but a few remain. A large number appear to have moved to a nearby telegraph pole and are continuing to defecate on the footpath below. Ms Young thinks some of them have also moved to her house. She said: “Since the works were carried out on Rodden Road railway bridge, a dozen or so pigeons have taken up residence on the roof of my house, so I have had a very unpleasant experience. “You can see the sort of mess they are causing, not to mention the smell. As I cannot access my roof I have no idea what other damage they might be causing up there. “The pigeons only appeared once the spikes were fitted at the bridge, and I had never had pigeons roosting on my roof before that. I’m not sure if other houses are affected in the same way as although they settle for a while on neighbouring roofs along New Road at dusk, they then roost overnight on mine. Last night I estimate there were at least a dozen. Another resident recently voiced concerns at a town council meeting over the continued presence of pigeons in the area. She said: “I’ve been campaigning to have spikes put under that bridge for six years and now that we’ve got them it has had an effect on the pigeons underneath – there are a limited number still there. “The problem still remains on a telegraph pole just next to the bridge however. The pigeons are continuing to poo on the footpath below and when it gets wet the path can become incredibly slippery. Frome town councillor Colin Cobb said: “We have been dealing with this issue for a while now. There are a few bits that have been missed under the bridge but there are certainly far fewer pigeons than there were before. “With regards to the cleaning of the footpath, The Landscape Group should have seen to that and it is something we will have to chase up with them. Frome Town Council has been approached for further comment. Homing pigeons have fouled Janine White’s garden, washing and children’s playhouse, got into her kitchen and even made it into her bedroom. She added: “They are taking every opportunity to fly into my house. Janine lives in Blackburn, Lancs, with mum Josephine, 54, and daughter Mia, one. She has been unable to trace her former neighbour and does not know what to do with the birds. She said: “I don’t know whether they want them back or they’ve abandoned them. “I think they left suddenly.